An alternative directory of plugins you say? Yikes! Well, it’s launching tonight at the NYC WordPress meetup officially. Apparently it’ll be the first directory of sorts that makes the actual usage data, at least via Bostjan Spetic who shared this news with us. The plans is that it’ll include a “superb” search engine that’ll help you find the best plugin for the job. It’s a completely independent and not-for-profit project. With thousands of plugins available, it’s not always easy to find the best one for your needs. it’s easier if you know just how popular it really is, so we have built an algorithm that estimates the actual number of active users of each plugin. 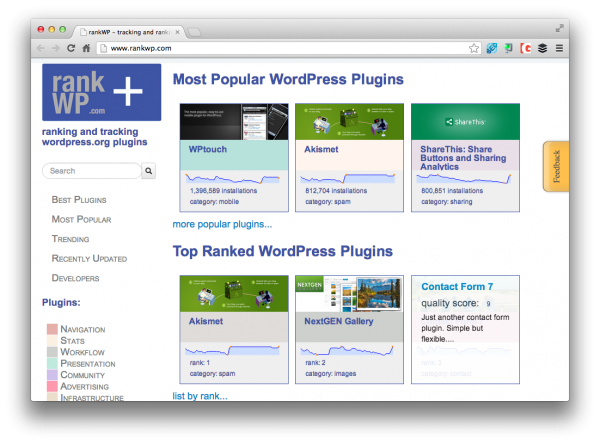 Plugins also become more or less popular over time, so we started tracking their popularity rank and show you how it’s changing. both of these informations are available now for all the plugins for the first time. From the looks of it the core offering is already in place – we’ll see where it heads long-term. Is this something that you’d use as you search and vet WordPress plugins?